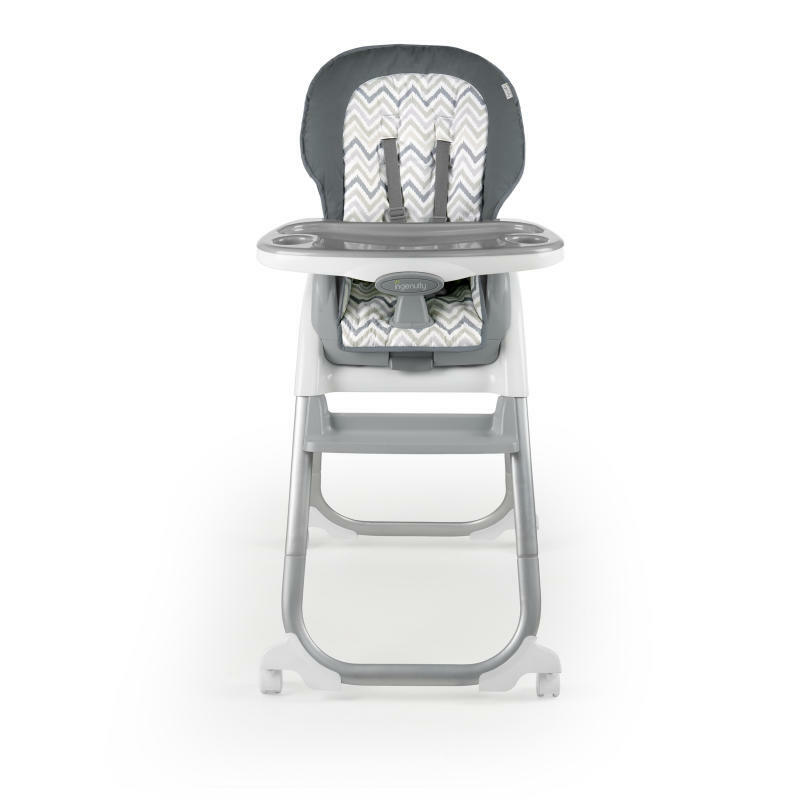 Trio Elite 3-In-1 High Chair - Braden is rated 4.3 out of 5 by 18. As every parent knows, kids grow up fast. The Trio Elite 3-in-1 High Chair from Ingenuity easily adjusts from full-size high chair to booster seat to toddler chair. The convertible high chair wipes clean instantly, the removable tray is dishwasher safe, and the seat pad is machine washable so you can slow down the clock by spending less time on kitchen cleanup and more time with your family. The dishwasher-safe EasyClean tray also features four locking positions to grow with your baby. And as your family expands, it can too. When used as a booster and toddler chair, it can seat two children at the same time. The sleek metal elliptical frame and neutral colors of this modern high chair are designed to complement the décor of any home. Seatpad/Tray/Tray Insert – Dishwasher safe. Wipe clean with a soft, clean cloth and mild soap.Plastic Parts – Wipe clean with damp cloth and mild soap. Air dry. Do not immerse in water.Frame – Wipe the metal frame with soft, clean cloth and mild soap. Rated 3 out of 5 by momandteacher from Nice Neutral High Chair I am writing this review based off how this high chair was in comparison to other high chairs I have used in the past. I loved the neutral colors of the hair chair and felt that the straps were easy to adjust. It is easy to wipe clean and I like that the front "table" part comes apart to make it even easier to keep clean. I did not feel like the table of this high chair was as easy to put on as it is with other high chairs. Usually, I am able to slide other ones on with one hand. I had some difficulty trying to get the table on and usually need a few attempts before it "snaps" in place. Rated 5 out of 5 by lesliet2345 from Looks perfect I got this chair as it grows with baby and can be used for years. I bought several different things for my daughter but this will take the place of them all for my son. It is well made and sturdy. I am very happy with this chair. Rated 5 out of 5 by SMakk from A versatile seat that you will use for years! We have been using the Ingenuity Trio Elite 3-in-1 High Chair in our home for the past several weeks, and have nothing but good things to say about it! Aesthetically, this high chair is beautiful. We have the Braden style, and love the clean lines, minimalistic design, and soft grey and white colour scale. The high chair was very easy to assemble out of the box, with no need for any additional tools. Day to day use is so convenient. I’m able to single handedly click the tray forward and backward, pop off the tray insert to put it into the dishwasher, adjust the recline of the seat back, and even pop the seat itself off of the base. The seat legs have a wide footprint, which we enjoyed for being so stable. The ability to remove the high chair seat to make a booster has come in handy on multiple occasions - we are able to bring the booster along when dining at a family members house, while leaving the rest of the seat at home. The straps are included in the base of the booster, making it a great portable option. Our toddler likes sitting in the base of the seat when we are at home, and calls it her “big girl chair”. It brings her to the same height as our kitchen table, and has the added security of built in straps. I love that we can still use the booster on one of our chairs, effectively making this two chairs for the price of one. The Ingenuity Trio Elite 3-in-1 High Chair is such an innovative design. All of my friends that have seen it have remarked on what a great design it is, and how much they love the removable booster! Cleanup is also a breeze. The seat pad wipes clean easily, and can be removed to be machine washed. The tray has withstood our dishwasher with no issues whatsoever. Rated 5 out of 5 by SMakk from A versatile seat that you will use for years! We have been using the Ingenuity Trio Elite 3-in-1 High Chair in our home for the past several weeks, and have nothing but good things to say about it! Aesthetically, this high chair is beautiful. We have the Braden style, and love the clean lines, minimalistic design, and soft grey and white colour scale. The high chair was very easy to assemble out of the box, with no need for any additional tools. Day to day use is so convenient. I'm able to single handedly click the tray forward and backward, pop off the tray insert to put it into the dishwasher, adjust the recline of the seat back, and even pop the seat itself off of the base. The seat legs have a wide footprint, which we enjoyed for being so stable. The ability to remove the high chair seat to make a booster has come in handy on multiple occasions - we are able to bring the booster along when dining at a family members house, while leaving the rest of the seat at home. The straps are included in the base of the booster, making it a great portable option. Our toddler likes sitting in the base of the seat when we are at home, and calls it her "big girl chair". It brings her to the same height as our kitchen table, and has the added security of built in straps. I love that we can still use the booster on one of our chairs, effectively making this two chairs for the price of one. The Ingenuity Trio Elite 3-in-1 High Chair is such an innovative design. All of my friends that have seen it have remarked on what a great design it is, and how much they love the removable booster! Cleanup is also a breeze. The seat pad wipes clean easily, and can be removed to be machine washed. The tray has withstood our dishwasher with no issues whatsoever. Rated 4 out of 5 by Harper0418 from Great high chair that is aesthetically pleasing I love that this is a 3 in 1 chair that can go with just about any table in any space. It was very simple to put together and very sturdy. The design is very nice and it isn’t cutesy so it doesn’t stick out in a dining room. The cover is a nice neutral and very easy to wipe down and clean. The rest of the seat is also very easy to clean. The base is a little wide so if you live in a smaller space measure the area you plan to use the chair in. The wheels don’t do great on carpet and can jam the mobility of the seat. Overall I really love the seat and am very excited for my little guy to grow with it! Rated 4 out of 5 by Harper0418 from Great high chair that is aesthetically pleasing I love that this is a 3 in 1 chair that can go with just about any table in any space. It was very simple to put together and very sturdy. The design is very nice and it isn't cutesy so it doesn't stick out in a dining room. The cover is a nice neutral and very easy to wipe down and clean. The rest of the seat is also very easy to clean. The base is a little wide so if you live in a smaller space measure the area you plan to use the chair in. The wheels don't do great on carpet and can jam the mobility of the seat. Overall I really love the seat and am very excited for my little guy to grow with it!